The T@B is the right size for my tow vehicle. It has an undeniable cuteness factor! 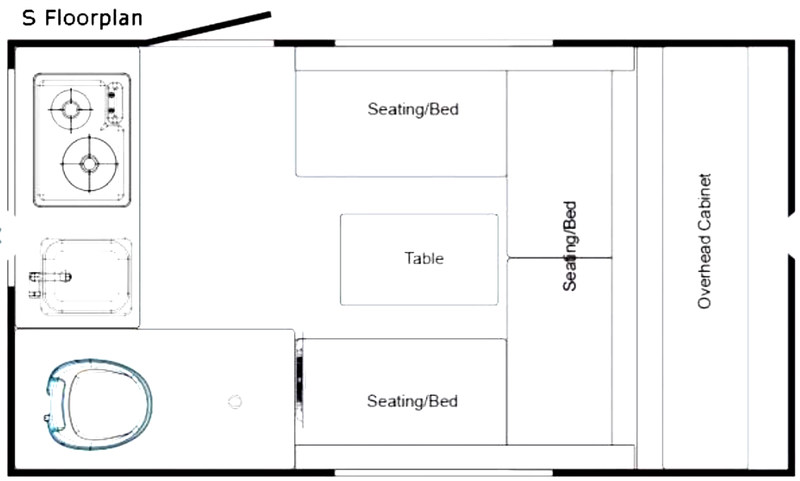 First of all, I chose a T@B above all other RVs is because of its size. I was originally seeking a truck with a powerful engine because I thought that I needed one to haul a huge trailer with all the bells and whistles. Boy was I wrong! After tons of research, investing hours on YouTube, and many sleepless nights, I came across an article that informed me that my 2016 Kia Sportage has the capacity to tow 2000 pounds. That tidbit of information was a game changer. I realized that I already owned a tow vehicle. I just needed to change the focus of my attention and switch my search to tiny trailers. RVTrader.com was a helpful resource for me. RV Trader lists hundreds of RV's of different makes and models from all over the country. I could literally see the size, specs, and gross vehicle weight rating all on one website. I was also completely committed -- I was willing to travel to purchase the trailer that I was looking for. It was a great day when I saw this ad pop up on RVTrader! My first thought was, "I can't believe this! This T@B is the right size for the right price!" My second thought was, "It matches my car! 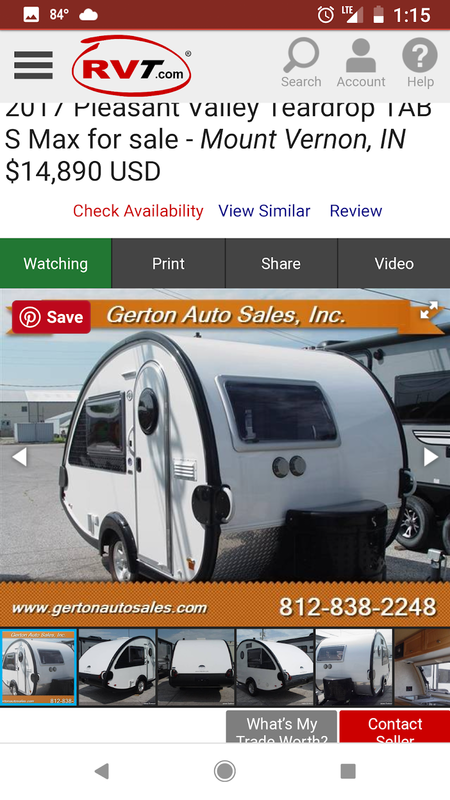 ", and my last thought was "At this price this RV will sell fast. I need to call the dealer ASAP!" Which is exactly what I did. After much research, I knew that older T@Bs were selling for more than the asking price of this one. I also discovered that this was the last and final price and it included the paperwork and walk through! I asked how much to take it off the market, sight unseen, and I was told that I needed to wire $500 with proof of identity. I jumped at the chance. John Gerton assured me that he sold RVs to women all the time. He told me "Beverly, don't worry about anything. 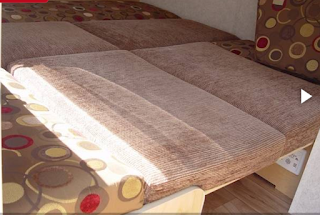 We will prepare your RV and let you know when it is ready for pick up." We kept in touch via email and by phone and for some reason I trusted John Gerton. I did not get that trusting feeling at dealerships that I visited in person. I have learned to trust my gut and this case, I am so glad I did. Everything worked out from the first initial payment, including the walkthrough. John even made coffee upon my arrival and set up my brake controller. 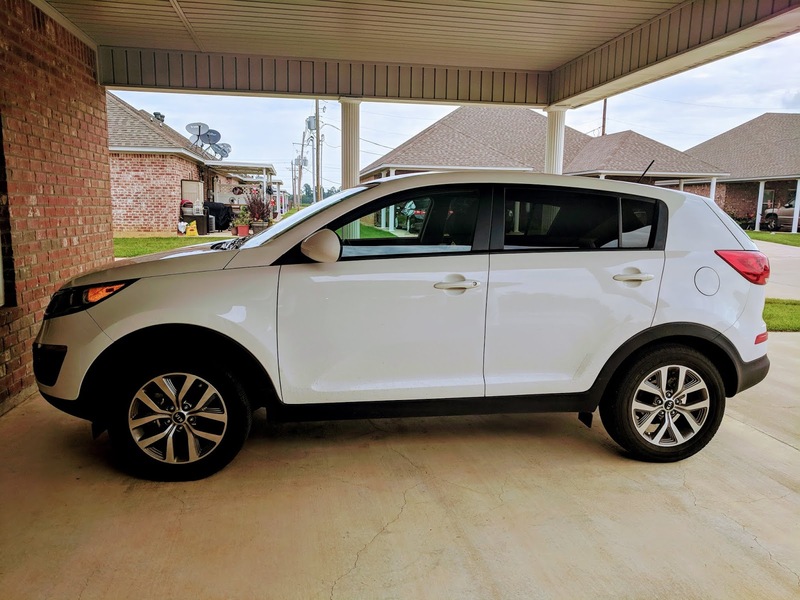 I highly recommend Gerton Auto Sales. For me, it was worth the drive all the way from Louisiana. I am pointing family members near Indiana to Gerton Auto Sales without hesitation. The second reason I chose a T@B is that it has enough storage to serve my needs. In spite of its size, it really is roomy. In fact, T@Bs are bigger on the inside than on the outside. Let's take a look at the floor plan for the T@B S Model. As you walk in, the galley is on the right. 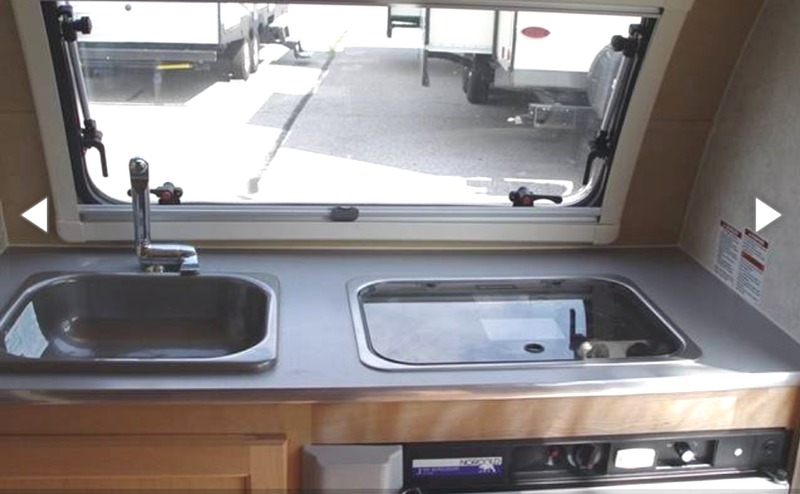 It includes a two burner stove, a compact fridge, and a multi-purpose sink. Directly in front of you is the wet bath. I required an inside galley and a toilet. Other models exchange a closet for a toilet and an outside kitchen. My review is focusing on the S Model with a wet bath and an inside kitchen. 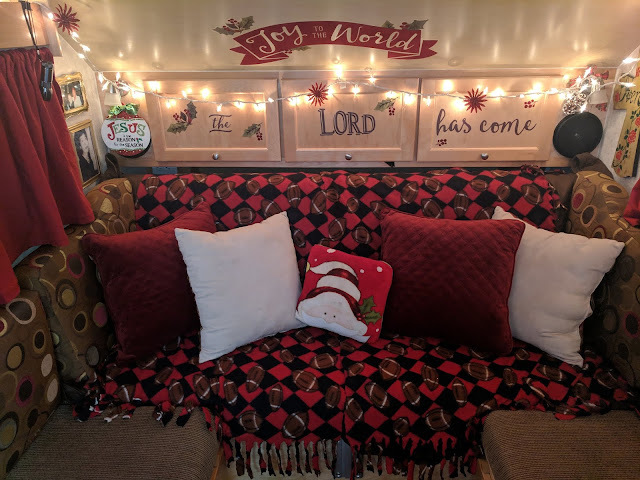 To your left, as you enter is the U shaped seating area which converts into a twin bed or a King size bed, depending on whether you want to take your bed down and set it up every day. Between the two benches is a Lagun table which swivels and can be removed and attached to the outside of the trailer for entertaining. Lagun table set up outside, Miles, my tiny trailer. 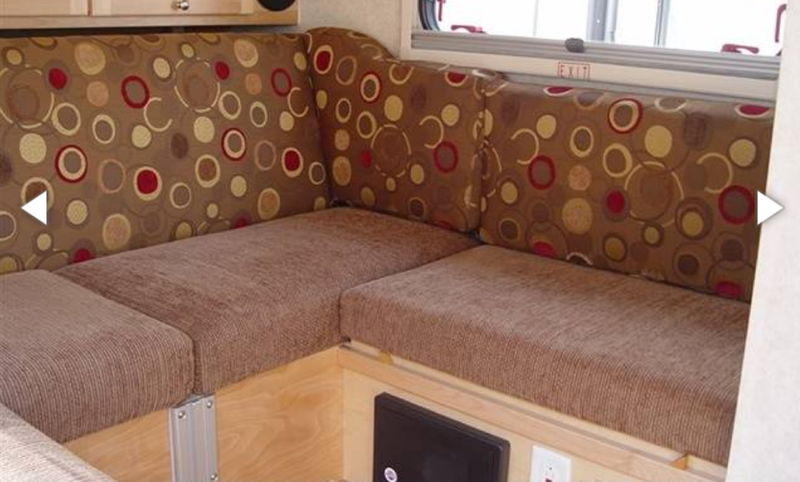 There is storage underneath the passenger side bench, while the bench on the driver's side houses the electrical units. You can access it for service only. I use the passenger side bench to store extra food items that must stand upright like bottles, etc. The Seating/Bed is a sofa during the day and folds down to make a full-size bed at night. Behind this is a bank of overhead storage bins. I store clothing here. I use one for pants, one for shirts, and one for skirts and dresses. Beneath the overhead storage is a cabinet for miscellaneous items. I use soft bins to store makeup, socks, underwear, and jewelry. There was just enough room for four soft baskets to house these items. Phew! Kitchen storage, on the other hand, is a challenge. The overhead cabinets are small and odd shaped. 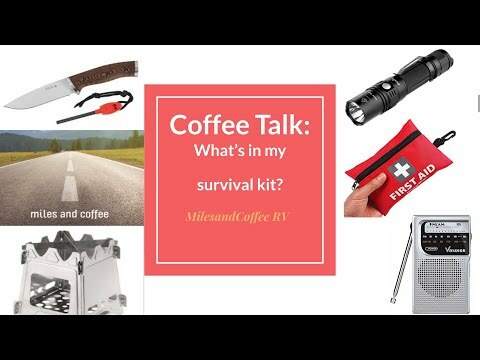 The cabinets under the sink are only big enough for the basic necessities. I keep spices, eating utensils, paper plates, and dry goods in the top cabinet. I have housed the Instant Pot in the bottom cabinet. I will post more about storage in a future post called Favorite Gadgets, Part 2: Comfort. The third and final reason for choosing my T@B is for its cuteness factor. 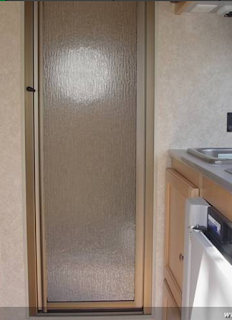 This tiny trailer is just too darn cute. 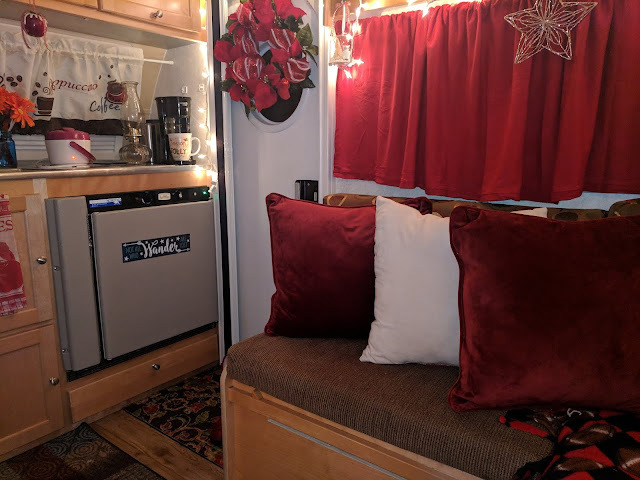 I had so much fun decorating it for Christmas and I get tons of compliments and questions at every rest stop or check-in. There you have it. My reasons for choosing a T@B are for its size, its storage, and its cuteness factor. I chose a T@B because it is as cozy and comfy as a Hobbit Hole! and it's just the right size for me to maintain independently.